Around the turn of the century, I started to hear the term digital native used to describe a person who grew-up in the digital age. Those of us who acquired familiarity with digital systems as an adult became digital immigrants. Both terms were popularized by Marc Prensky in his 2001 article entitled Digital Natives, Digital Immigrants. Educators started to accept the notion that the arrival and rapid dissemination of digital technology changed the way students think and process information, made it difficult to excel academically using outdated teaching methods, and required a media-rich learning environment to hold the attention of our students. Like many educational trends, this one has run its course. Education is a balance between what is timeless and what is informed by ongoing research on how a child learns best. The goal for each child should be deep learning that requires mastery over time and multiple representations of a concept. Of course, we must ask, “What’s next for our children?” and prepare them for their future. However, we can never abandon the power and promise of the present moment for our youngest learners. Every interaction a child has during the course of the day shapes his or her future, and shouldn’t most of those interactions involve actual reality and the people who surround them? Delay, and delay again – Years of navigating and negotiating play, interacting with a rich environment, and making learning visible should precede technology use. As kids head off to middle school, the Wait Until 8th movement is taking off, allowing kids to be kids just a little longer. Smart kids will use smart devices in smart ways – Make sure your child is smarter than the device being used. It’s not just about the content that becomes accessible to them; it’s also about being digitally smart. Developing digital citizenship can start well before any device is even in the picture. Common Sense Media is a great resource for teachers, families, and schools. 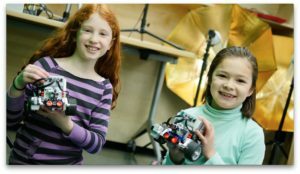 An integrated and developmental approach – Robots and coding are so much more developmentally in line with young learners than tiny keyboards. Programming a robot to disco dance lights up all parts of the elementary child’s brain and helps develop that slow knowledge, in community, and having some fun all the while. By early October, I know each of the children at my school. As Head of The Valley School in Madison Valley, I get to greet our students by name each morning at the gate and ask questions that let them know I care about them. With just over 100 students in pre-kindergarten through fifth grade, our school provides the close connections and sense of belonging that increase a child’s engagement in learning. 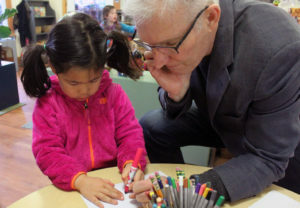 Learn more about independent school options and the benefits of our schools on the Puget Sound Independent School website.